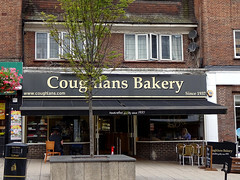 Cafe and bakery in Wallington, part of a small chain based in Croydon. On the left as you go in there's a long counter displaying decorated cakes and other baked goods, with loaves of bread (including some interesting varieties such as sourdough) on shelves behind. A fridge to one side holds a few pre-made sandwiches, but they also do made-to-order ones. On the right there's a cafe area providing seating for around 22 eat-in customers. The decor here is in shades of brown, with wood-panelled walls, varnished wooden tables, and pale brownish-peach tiles on the floor. Chairs are half-round armchairs, generously sized. There's also seating for half a dozen on the pavement outside under a canopy. Order and pay at the counter, and they'll bring the food when it's ready. Like the rest of the chain, they make an effort to be vegan-friendly, with several vegan sweet and savoury options clearly marked on their menus and displays. secretlondon went there one lunchtime in November 2016. I had a toasted American rye bread sandwich which came as part of a 'meal deal'. This was a sandwich, any cold drink and either a jam doughnut or a bread pudding. It came to about £6, including extra (probably just VAT) for eating in. The food was nice and I particularly liked the bread pudding. They sell coffee and it seemed quite a popular place to eat lunch, although an older crowd not office workers. On another visit I bought a large sourdough loaf for £2.20. When Kake visited on a Monday morning in June 2018, there were three or four other sit-in customers as I arrived around 8:30am, and various others were in and out over the hour and a half I was there, many seemingly regulars. A talk show with '80s music was playing on the radio, mostly too quiet to hear. Service was friendly and helpful, and they had no problem with me sitting and working on my laptop after I finished my food. I went for the only vegan toastie they had available that day — wild mushrooms on sourdough (£4.40) photo and a pot of tea (£2). This formed some sort of meal deal which got me a free piece of bread pudding (also vegan, and usually 85p; the other option would have been a similarly-vegan jam doughnut). I got this packaged for takeaway. The wild mushroom filling turned out to be the same as or very similar to the filling of their vegan sausage rolls (which I have previously enjoyed from their Sutton branch). It was pretty tasty, but I wished it had been served just a little warmer. It also got a bit samey towards the end. The bread was fine. Overall, I'd thoroughly recommend it to any actual vegan (aside from mushroom-haters). They don't have WiFi of their own, but advised me to connect to the free WiFi from HSBC next door — this worked OK, though it was a bit laggy. Accessibility: A ramp with handrail to get in. No steps to the toilets, and the ladies' is a very large cubicle (more of a room really). Last visited by Kake, June 2018. Opening hours taken from the Coughlans website, June 2018. Last edited 2018-08-16 13:39:07 (version 6; diff). List all versions. Page last edited 2018-08-16 13:39:07 (version 6).